1. I used a couple of links of hot Italian sausage. Took the sausage out of the casing and browned in a pan for a bit. Then I added 1 cup of chicken broth mixed with 1 tablespoon of tomato paste to the sausage pan and let the sausage continue to cook for 2-3 more minutes. 2. While the sausage business was going on, I started prepping for the fake risotto. I used a shallot and a leek (instead of an onion). Here’s something that I think makes a big difference- I used both the white and green parts of the shallot. The white parts I sliced like I normally would and the green parts I chopped into small pieces it was almost minced. 3. 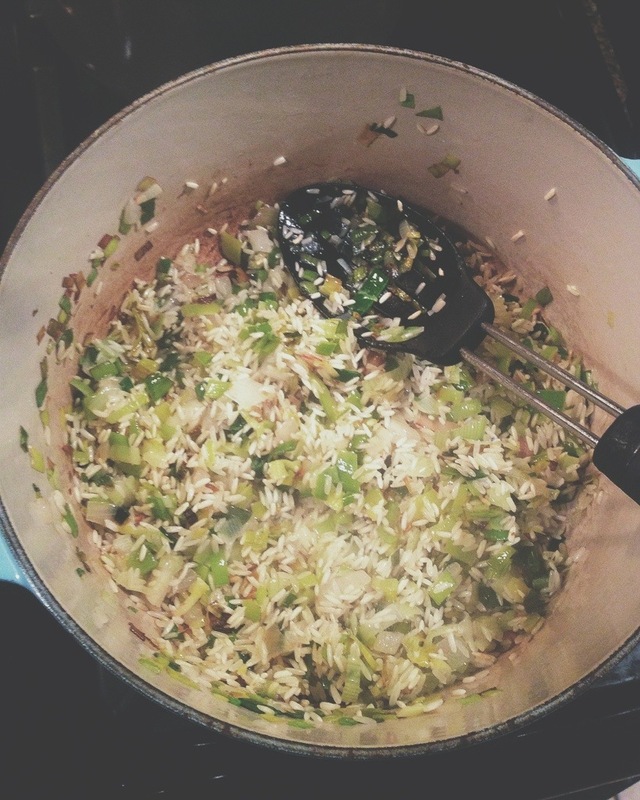 Sautéed the shallot and leek mixture for a few minutes. Then added the rice and cooked until a little golden. Then I added the sausage and be oth to the pan and stirred until absorbed. Then added the white wine (~1/2 cup). Then the broth. And it was risotto cooking as per usual. Lots of stirring. The end product was incredible. Didn’t take a pic. This is SO easy and you get a huge return for such little effort. Seriously make this. This entry was posted in weeknight and tagged leak, risotto, sausage, shallot, weeknight. Bookmark the permalink.